← Oh no, not again . . . another close call. Try as I may, I can’t put it off any longer . . . If there’s a perfect day to do income taxes, today is such a day. It’s miserable outside. The wind is cold and relentless. Which, now that I think about it, is what I’ve heard about the IRS. I do a search for TurboTax and click on the download button. I’ve got to do this. I can’t put it off any longer. Bridget and Spike are restless. I know what’s going to happen. I’ll get right in the middle of the tax return and they’ll start pestering me to go outside. There’s going to be a storm soon, so we might as well get this over with. Once the crew is suited up, I open the door. The wind whips it out of my hand. What a dark and dreary day! I tighten up my hat and adjust my walking stick. Out on the road a car approaches. “Oh my gosh, I don’t believe it!” The man gives me a big smile and introduces himself as Don, one of the readers of my blog. He’s from North Carolina. We manage to have an enjoyable conversation in spite of standing in the middle of a raging windstorm. After Don drives away, the crew and I continue up the road. I look up the hill expecting to see my neighbor’s camp. Camo man is gone! I never heard him drive by our camp on his way off this section of the Kaibab National Forest. I’m strangely disappointed, and wonder who he was, what brought him to this place, and where he’s going. The wind is really hammering us now. We turn back toward home which delights Bridget in particular. She strains at her leash. I unhook them both, and away they run at top speed into the wind to wait for me at the door of the BLT. Now they’ll take a nap and I can do . . . . yuck . . . those damn taxes. "Spike is hogging the bed!" Ooh, it feels so good inside. Over on the table my laptop sits waiting with gaping jaws. A box of unorganized scraps of paper and documents squats sullenly at its side. Oh, how I hate this job . . . Suddenly rain pelts the windows and wind buffets the side of the BLT. I peek through the blinds. I reach up into the cabinet over the stove and pull out a skillet. What I need is a scrambled-egg-and-salsa burrito . . . and, let’s see, hmmm . . . and another cup of coffee. Then I’ll do the taxes! This entry was posted in Simple living and tagged Arizona, Ash Fork, camping, Kaibab National Forest, taxes, Turbo Tax, weather. Bookmark the permalink. 18 Responses to Try as I may, I can’t put it off any longer . . .
What’s your hurry – you have almost a week left!! I haven’t done my taxes yet Sue, don’t feel bad. I usually have it done right after I get my forms but not this year! My son has to help me now that I have a small jewelry business. I hope you get yours done so you can put it behind you. Stay warm and dry. I love hearing the rain on the roof. Puts me to sleep. I feel better that camo man has gone. Hi Sue, Got rain showers and wind this afternoon and breezy tonite. Sky and sunset gorgeous with all the clouds! And they force me to drive guests back and forth to the Zion Visitors Center 3 days a week. Life is GOOD!!!! Oh the joys of full time’n. If it ain’t the wind, it’s the rain. Then on top that…..the IRS hound’n ya for your last dollar. And then the dogs wanna go for a walk. But don’t ya just love it? Hope your little cocoon isn’t rocking too much in that wind! Right there with ya on those taxes. I just can’t seem to keep at it especially when it looks like I’m gonna owe them. How can that be when my income is way down. I thought income down=taxes down. So I do it in short spurts. Let’s see I have 4 more days right?? Was just on the weather channel and found this link to help us with finding scenic drives, listed by state…maybe you know of this already: http://www.weather.com/outlook/driving/scenicdrives/?sd=az_index.jsp&list=y …maybe it should go elsewhere on your blog…but I found it interesting and helpful. I love your blog Sue. Hope to meet someday. Looks like Spike is hogging the heat and the bed. Feels good to get the taxes done. Did I miss the photo of your Mick stick? I am saving the tax return prep until Saturday. I also need to go to motor vehicles division on Saturday too! So my weekend is just going to be chock full of fun stuff… I am sure I will be waiting at motor vehicles a long time.. maybe I will take my laptop and do my taxes there..hmmm… maybe not. I am happy for you that yours are done. That is such a great chore to be able to cross off the list! Glad you got the taxes done and were snug in your Casita rug. One of the things I have really enjoyed about the Casita is the ability to cocoon and just relax when it’s yucky outside. We have a couple of “stack jacks” we use under each side of the front frame in addition to the rear stabilizers cause I don’t want the Casita to wiggle at all and Paul likes to take the weight off the tongue jack. Do a search on Stack Jacks if you want some easy extra stability. They’re lightweight and easy to use. I’m afraid I would find the grueling task of doing taxes just too taxing for my short attention span. Kelly fills out the preliminary stuff & then we take it to a tax place. A stormy day can be a cozy day once in a long while & I generally find a short storm, exciting. Always a bit scary when an unidentified vehicle, person or persons approach the campsite unannounced. Been on the receiving end of that situation before & it can be uncomfortable.. Very rare for Kelly or I to approach other campers..
Hey Sue, Here’s hoping your tax reporting is virtually nil next year . . . . or nothing at all. I’ve had 2 years of not sending in a report – no money! Am finally at the bottom end of that 99%! Did you remember to include the Part B premium deduction from your SS deposit; or do you pay that yourself? Yay! Your taxes are done and the storm has passed. Ours are done but just need to mail them. I figure when your paying some in, let them wait til the 15th. 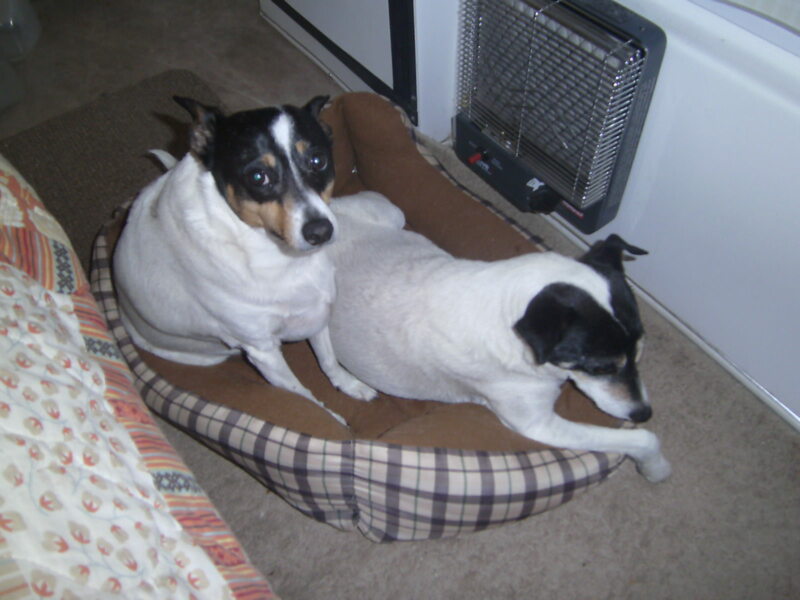 Love the picture of Spikey begrudgingly “sharing” his bed with Bridget. Enjoy your day. Looking forward to seeing more pics and stories. Took several days, but I started at the beginning and caught up to where you are now. You got guts lady! I envy you. (Bet you haven’t heard that one before.) I’ll be following along cheering you on.